Chicago, IL (April 3, 2019) — The world’s biggest Star Wars collecting sites have come together to form an unstoppable collecting alliance. 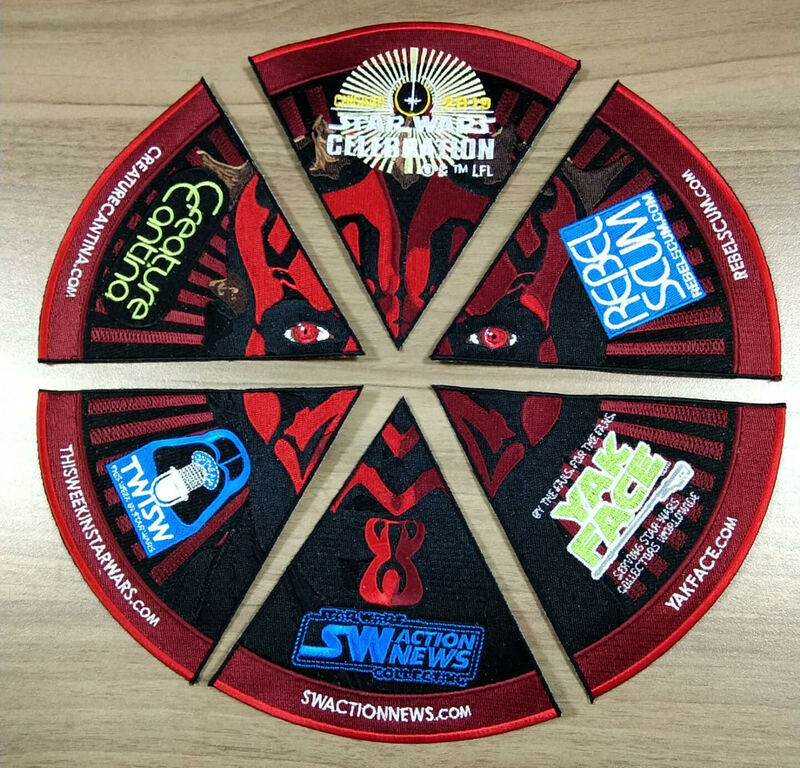 Acclaimed fan sites and podcasts Creature Cantina, Rebel Scum, Star Wars Action News, This Week in Star Wars, and Yakface are giving away an exclusive puzzle-patch set at Star Wars Celebration Chicago. 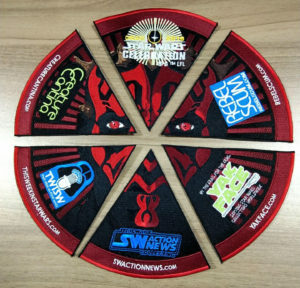 When combined, the full six-piece forms an image of iconic Star Wars villain Darth Maul, commemorating the 20th Anniversary of Star Wars Episode I: The Phantom Menace. Click on through for details. Hasbro’s SDCC Panel has just begun. Click through to watch live via SWActionNews. Our friends at Star Wars Action News have posted a detailed transcript of their QnA session with Hasbro regarding the upcoming Jabba’s Sail Barge from HasLab. Click on over for the full details then, get your order in and #backthebarge. 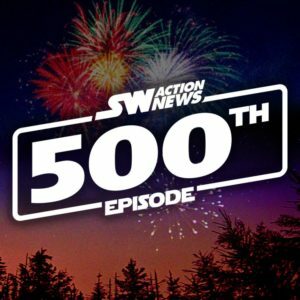 Star Wars Action News’ 500th Episode! Congratulations to Arnie, Marjorie and the entire SWAN team for their milestone podcast! Star Wars Episode VIII: The Last Jedi has earned a billion dollars, is loved by critics, but also seems to divide fans online. Now the Star Wars Action News team comes together to give their reviews–and they’re divided as well. Join them to find out where the common ground lies, and their excitement for Solo in this new Star Wars Action News podcast! The exclusives, the news, the reveals! Force Friday is a few short weeks away and (aside from a few leaks) Star Wars fans have little idea what to expect. But some news was had at the two big Star Wars events in July — D23 and SDCC! On this new Star Wars Action News podcast Daryl joins Arnie and Marjorie to bring first-hand accounts from both conventions. Find out about the exclusives, the reveals, and more! Forty years ago today blockbuster movies jumped to hyperspace. Science fiction was forever changed, as were the lives of millions of moviegoers. Over the four decades since Star Wars’ popularity has only grown, as have the collections of fans. On this Star Wars Action News Marjorie and Arnie discuss the few 40th Anniversary exclusives released. And then they are joined by Justin, Brock, and Andrew to reminisce on some of their early Star Wars collecting memories. Also on this week’s show, a wrap-up of Celebration Orlando, a review of the new Thrawn novel, and a look at HASCON — the official Hasbro con coming this September. 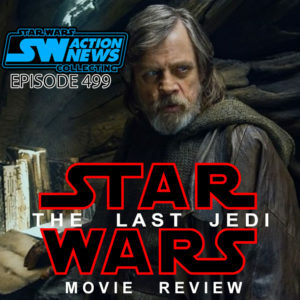 All this and more on the new Star Wars Action News podcast! Episode 483: ICE — Collecting to the Extreme! The coolest Star Wars collections are on ICE! Over Labor Day weekend a group of Star Wars collectors from across the globe gathered in the Washington DC area for an International Collector’s Event–or ICE. Items were sold and traded, collections were put on display, and friends swapped stories. All while traveling through Virginia and Maryland visiting a dozen Star Wars collections! Marjorie and Arnie were on-hand to see these impressive displays and talk to some of the other attendees. So kick back and enjoy this extra-cool episode of Star Wars Action News! The Return of Maul and X-wing Luke? 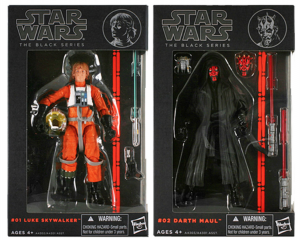 No, it’s not a synopsis for a Season 3 episode of Star Wars Rebels, Arnie from Star Wars Action News has posted word that Hasbro is interesting in getting the sought after 6″ Black Series Darth Maul and X-wing Pilot Luke Skywalker back to retail. You can see Arnie’s exact quote on their Facebook page.